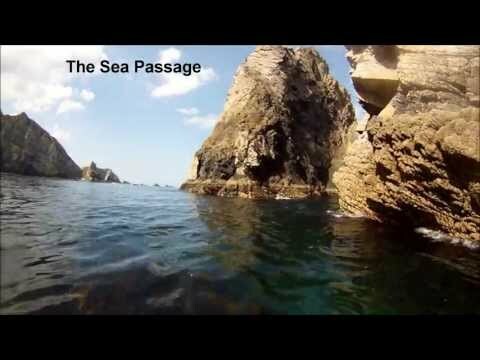 Sea passage to the base of the sea stack. Approaching the summit after climbing a new route up the sea ward face. Looking down the sea ward face of Cnoc na Mara. Troops just after the First ascent of Cnoc na Mara. 12 climbers, 3 Rib's and a 152m of outstanding adventure climbing. Getting off Cnoc na Mara. When I first saw this 100m sea stack from the overlooking clifftops it was the inspiration to climb every unclimbed sea stack in Donegal. It is safe to say this stack represents all that is great about adventure climbing. It's impressive soaring 150m long landward arete provides one of the most rewarding and adventurous rock climbs in Ireland. It is easily an equal to the mighty Old Man of Hoy off the Orkney Islands in the north of Scotland. Access is by a monsterous steep grassy descent followed by a 50m abseil to a storm beach at the entrance to Shambala. As you descent this steep slope, sitting out to sea, Cnoc na Mara grows with height as you descend reaching epic proportions as you get closer to to beach. Gaining the beach alone is an adventurous undertaking in it's own right and is an excellent taster off what is to come. From the beach paddle out for about 120m to the base of the stack. The sea ward face of this stack holds a further two routes both weighing in at about VS and 130m long. This sea stack requires a great deal of care and attention to detail as the potential for epics are huge but the rewards are even greater. 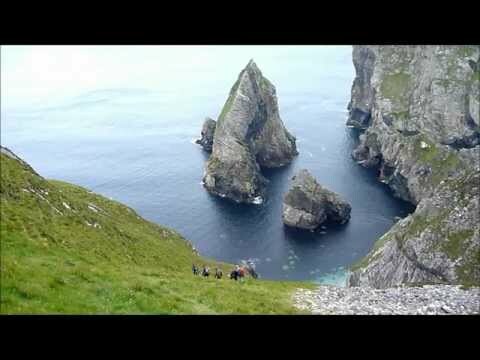 Donegal sea stack guidebook for more deatils of the routes on Cnoc na Mara.